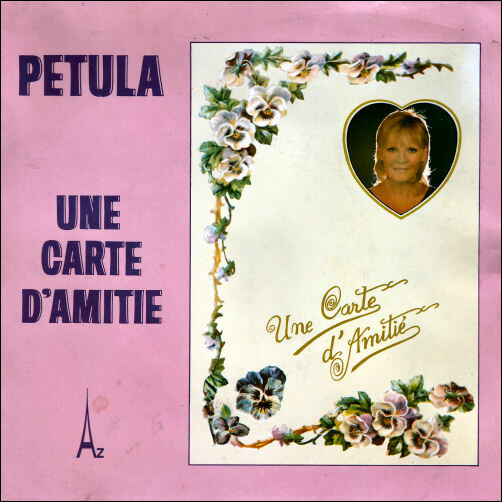 After Petula left Vogue France she began recording material in 1972 independently under her own production company Progenar. 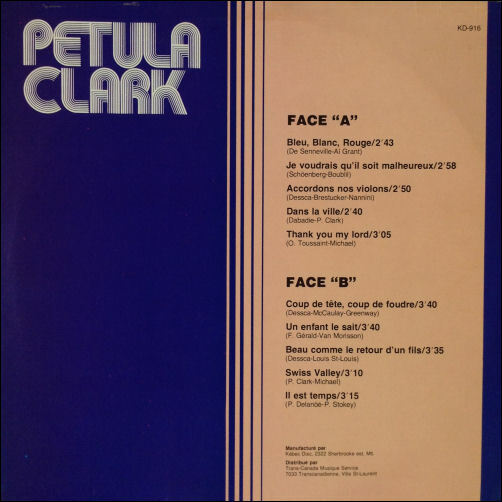 In total there are 14 recordings in French - these recordings are often referred to as the AZ Recordings and were issued between 1972 - 1984, including one stand alone original album and various 45rpm singles. In addition to the 14 recordings, there are released alternative versions of Blue Blanc Rouge and Thank You My Lord. 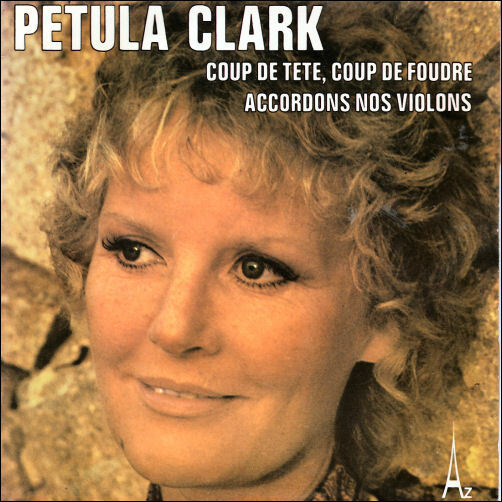 These 16 recordings were initially issued in France by Disc 'AZ, and then later included on releases in Canada on Kebec Disc, Audiogram and on Lion-Soleil, in the UK on PRT, in France on Reader's Digest, Sanctuary / BMG and Sony and in Germany on Bear Family Records. In addition to the 16 recordings, there are 2 English language recordings from 1973 of Thank You My Lord and Swiss Valley which were first issued in the US on the album Open Your Heart in 2009 on Collectors Choice. Disc'AZ was a French label established in 1963 by Lucien Morisse, a French songwriter and the artistic producer of the popular Radio Europe 1 who was married to the singer Dalida. 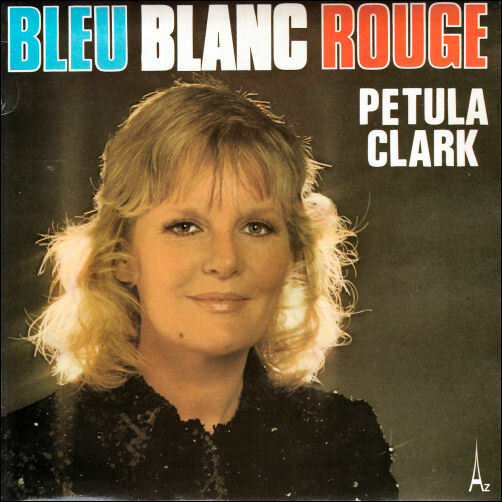 Composer Paul de Senneville was a director at Disc'AZ and contributed with his writing partner Olivier Toussaint three original songs for Petula's AZ album; Bleu, Blanc, Rouge, Une Carte D'Amitie and Thank You My Lord. For some activities Disc'AZ was just known as AZ (i.e. distribution and marketing). Although Disc'Az acted as a distributor itself, marketing strategies changed over time, and the label was handled via many other distributors, including: Disques Vogue, Discodis, Musidisc, and was then bought up by Universal in the late 1990s. 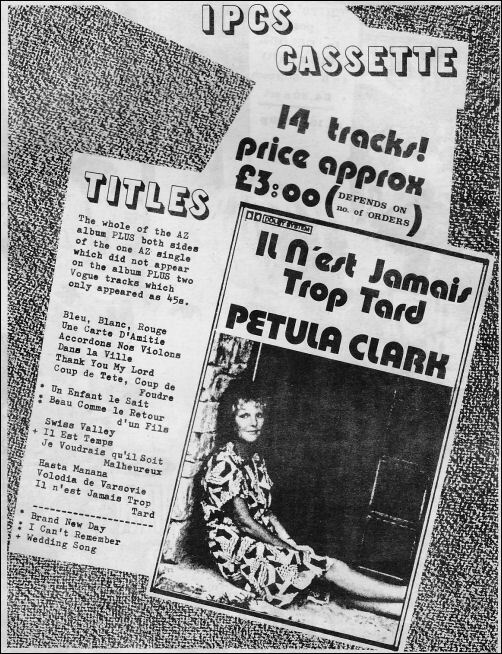 The SG prefix to Disc'AZ releases were Discodis distributed issues - the SG prefix was assigned to all the Petula single releases meaning that the likely arrangement in place was a distribution deal rather than a recording deal. 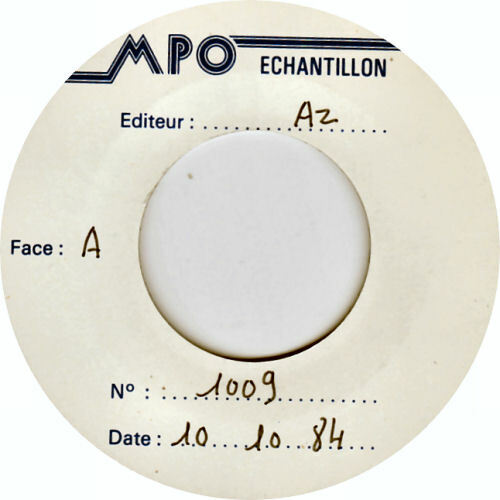 It is understood that the master tapes for 10 of the AZ recordings are missing (Bleu, Blanc, Rogue - purple engraved label alternate version issued as a single in 1972, Une Carte D'Amitie, Accordons Nos Violons, Dans La Ville, Thank You My Lord - purple engraved label alternate version issued as single in 1973, Coup De Tete, Coup De Foudre, Swiss Valley, Je Voudrais Qu'il Soit Malheureux and Hasta Manana) and during recent discussions and email enquiries around these recordings the subject of the lost master tapes repeatedly comes up and that due to the amount of masters missing, these are songs that newer fans and collectors will never get to hear. There has been an occasion where the actual tape sources for 2 songs that are missing have been mastered from vinyl (Swiss Valley, Je Voudrais Qu'il Soit Malheureux) for the 2001 French Reader's Digest release which is now also highly collectable. 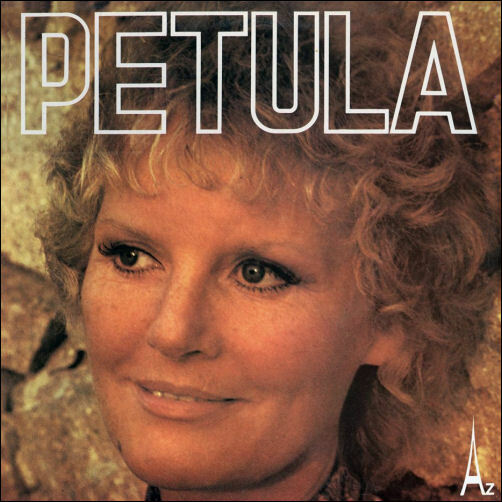 The AZ album entitled Petula (STEC 151), featuring 10 of the 14 recordings, was issued in France in December 1973. 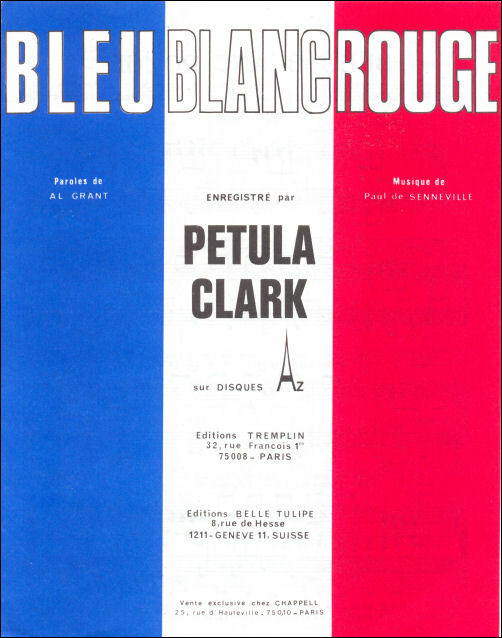 The album features 3 Clark compositions Bleu, Blanc, Rouge (lyrics), Dans La Ville and Swiss Valley (music). 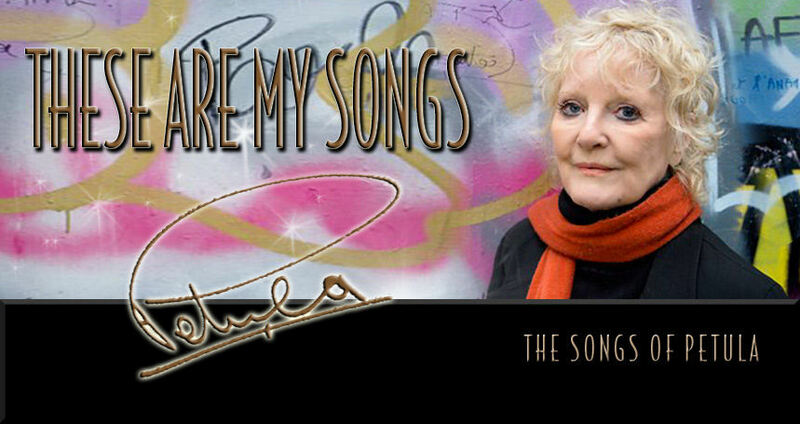 The album material comprises of original songs (mostly contributed by Disc'AZ director Paul de Senneville) alongside French language covers and adaptations of Petula's recordings; Wedding Song (There Is Love), Brand New Day and I Can't Remember (How It Was Before). 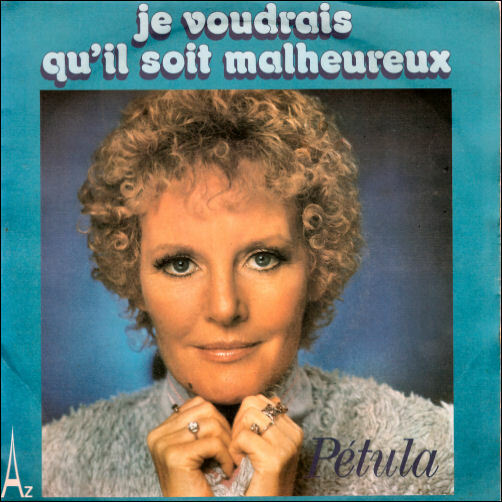 For the French language recordings of Brand New Day (Un Enfant Le Sait) and I Can't Remember (How It Was Before) (Beau Comme Retour D'un Fils), Petula utilises the original English backing tracks and English backing vocals can be heard lower in the mix. 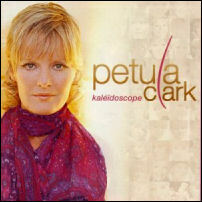 This album is a fan favourite and is one of the most collectable Petula Clark releases to have been issued. 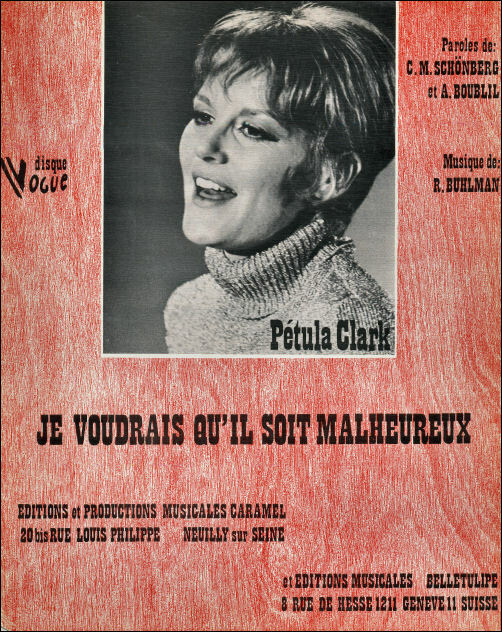 The album, entitled Petula Clark was later issued in 1975 in Canada on Kebec Disc (KD-916) with Je Voudrais Qu'il Soit Malheureux (a new Progenar recording also issued as a single in France) replacing Une Carte D'Amitie. In the autumn of 1976, the fan club (under Pet Projects) issued a private 14 track cassette of the whole AZ album with 4 bonus tracks. 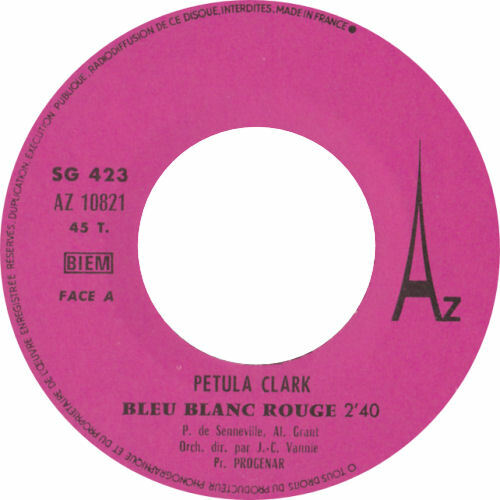 Issued in December 1972, The pink label release of Bleu Blanc Rouge is a 45 issue of the album take. The master tape of this version survives. Il Est Temps, written by Pierre Delanoe, is the album take and the master tape survives. 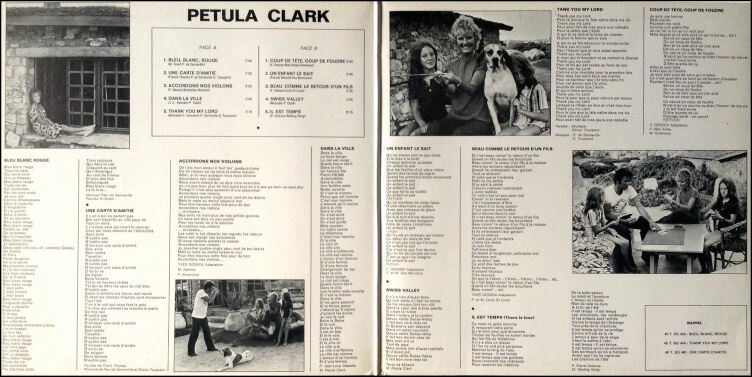 Also issued in Canada as a 45 in 1973 on MGM. 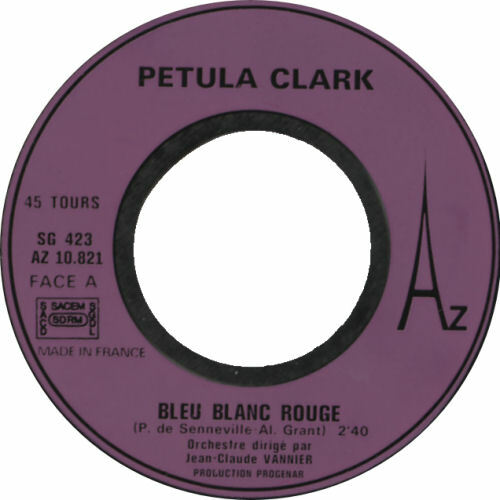 Issued in December 1972, the purple engraved label (pictured above right) release of Bleu Blanc Rouge is a 45 issue of an alternate take. The master tape of this version is missing. Il Est Temps, written by Pierre Delanoe, is the album take and the master tape survives. Issued in June 1973, Thank You My Lord is an alternate version to that issued on the album. The master tape of this version is missing. 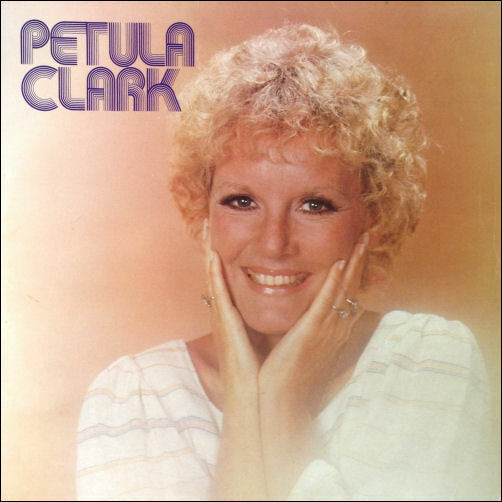 Swiss Valley is the album take - the master tape is missing although a mastered version from a vinyl source appeared on the 2001 French Reader's Digest 3 CD box set entitled: Petula Clark. The cover photograph of the 45 is by Harry Langdon. Thank You My Lord and Swiss Valley was also issued in the Lebanon in 1973 on Disc'AZ (AZ 9027). In Canada, Thank You My Lord b/w Dans La Ville was issued in 1973 on Kebec Disc (KD-9014). 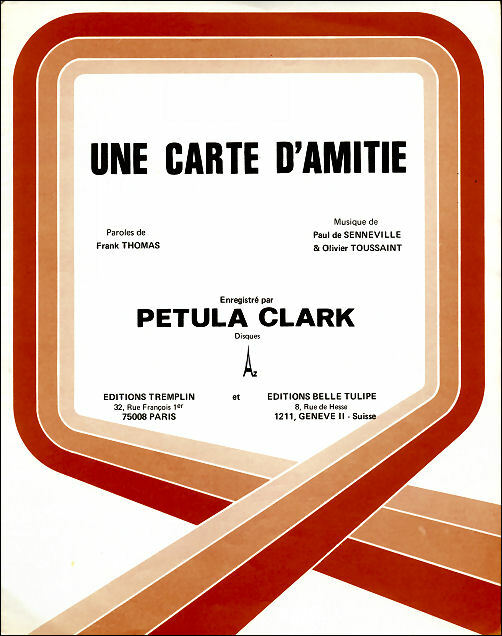 Issued in October 1973, Un Carte D'Amitie and Dans La Ville are album takes issued on 45s. The master tapes for these two recordings are missing. 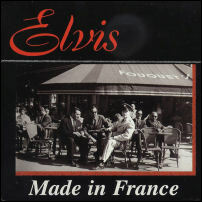 Issued in November 1973, Coup De Tete, Coup De Foudre (a French language adaptation of the 1973 Elvis Presley song Love Me, Love The Life I Lead) and Accordons Nos Violons are album takes issued on 45s. The master tapes for these two recordings are missing. 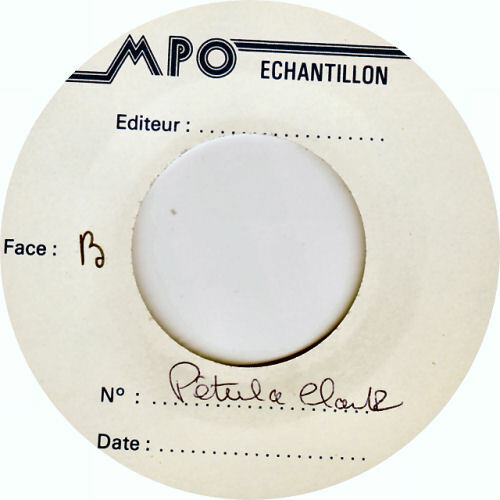 Issued in January 1975, Je Voudrais Qu'Il Soit Malheureux and Hasta Manana were issued on 45s in France on Disc'AZ and in Canada on Kebec Disc. The recordings were produced by Claude-Michel Schonberg and Alain Boublil. 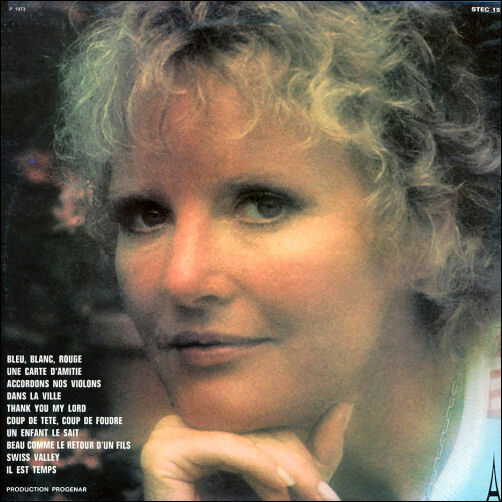 The master tapes for these two recordings are missing although Je Voudrais Qu'Il Soit Malheureux was mastered from a vinyl source and first appeared on the 2001 French Reader's Digest 3 CD box set entitled: Petula Clark. 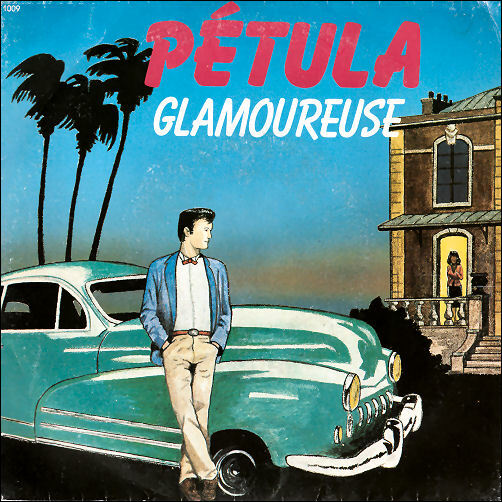 Recorded in London at Trident Studios and first Issued in France in November 1984, Glamoureuse and Mister Orwell were produced for record by Luc Plamondon and Jamie Lane. 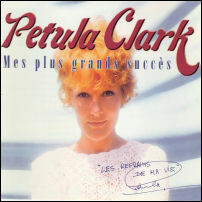 In Canada the two tracks were issued on Audiogram and in the UK Glamoureuse was issued by PRT as the B side to an English language recording of Mister Orwell. Corrections and submissions are gratefully accepted.